So, every now-and-then I have to remind you that this is a WFS (Witch Friendly Site) because as we know, not all Pagans are Witches, but all Witches are Pagan, and in doing so I would like to remind you that on this day in 1989, Patricia Hutchins was granted religious leave by the United States Air Force to observe the eight Sabbats of the Wicca religion. Ms. Hutchins was the first Wiccan in history to have Wiccan religious rights granted by the U.S. military. Candlemans Sabbat (also known as Imbolc, Oimelc, and Lady Day) is celebrated annually on February 2. Traditional ritual herbs: angelica, basil, bay, benzoin, celandine, heather, myrrh, and all yellow flowers. Altar decorations traditionally include a crown of thirteen red candles, a sprig of evergreen, a besom or Witch's broom to symbolize the "sweeping out of the old," a small statue or figurine representing the Triple Goddess in Her aspect of the Maiden. Traditional Sabbat incense: basil, myrrh, and wisteria. Sacred Sabbat gemstones: amethyst, garnet, onyx, turquoise. Sabbat deities: The Goddess in Her Maiden aspect, Brigid (Celtic goddess of fire, wisdom, poetry, and sacred wells; also a deity associated with prophecy, divination, and the arts of healing), and Aradia (the daughter of Diana, and "founder of the Witch cult on Earth"). Candle colors: white, red, pink, brown. The Traditional Pagan foods of this Sabbat are those that represent growth, such as seeds (pumpkin, sesame, sunflower, etc. ), poppyseed breads and cakes, and herbal teas. Beltane Sabbat (also known as May Day, Rood Day, Rudemas, and Walpurgisnacht) is celebrated annually on May Eve and/or May 1. Traditional ritual herbs: almond, angelica, ash tree, bluebells, cinquefoil, daisy, frankincense, hawthorn, ivy, lilac, marigold, meadowsweet, primrose, roses, satyrion root, woodruff, and yellow cowslips. Altar decorations traditionally include a small Maypole and/or a phallus-shaped candle to symbolize fertility, a daisy chain, springtime wildflowers. Traditional Sabbat incense: frankincense, lilac, and rose. Sacred Sabbat gemstones: emerald, orange carnelian, sapphire, rose quartz. Sabbat deities: Flora (Roman flower-goddess), the lunar goddesses Diana and Artemis, Pan (the Greek horned goat-god of woodlands, fields, shepherds, and fertility), Faunus (the Roman equivalent to Pan), and all gods and goddesses who preside over fertility. Candle colors: dark green and all colors of the rainbow spectrum. The traditional Pagan foods of this Sabbat are all red fruits (such as strawberries and cherries), green herbal salads, red or pink wine punch, and large, round oatmeal or barley cakes known as "Beltane Cakes." Lammas Sabbat (also known as Lughnasadh, August Eve, and the First Festival of Harvest) is celbrated annually on August 1. Traditional ritual herbs: acacia flowers, aloes, cornstalks, cyclamen, fenugreek, frankincense, heather, hollyhock, myrtle, oak leaves, sunflower, and wheat. Altar decorations traditionally include corn dollies (small figures fashioned from braided straw) and/or kirn babies (corncob dolls) to symbolize the Mother Goddess of the Harvest. Traditional Sabbat incense: aloes, rose, and sandalwood. Sacred Sabbat gemstones: aventurine, citrine, peridot, sardonyx. Sabbat deities: Lugh (a Celtic solar deity worshipped by the ancient Druids), John Barleycorn (the personifications of malt liquor), Demeter, Ceres, the Corn Mother, and other goddesses who preside over agriculture. Candle colors: golden yellow, oragne, green, light brown. The traditionbal Pagan foods of this Sabbat are homemade breads (wheat, oat, and especially corn bread), barley cakes, nuts, wild berries, apples, rice, roasted lamb, berry pies, elderberry wine, ale, and meadowsweet tea. 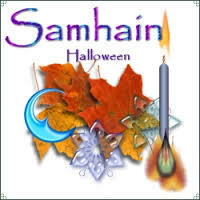 Samhain Sabbat (also known as Halloween, Hallowmas, All Hallows' Eve, All Saints' Eve, Festival of the Dead, and the Third Festival of Harvest) is celebrated annually on October 31. Traditional ritual herbs: acorns, apples, broom, deadly nightshade, dittany, ferns, flax, fumitory, heather, mandreake, mullein, oak leaves, sage, and straw. Altar decorations traditionally include a jack-o'-latern, apples, cnadles in the shapes of Witches, (as well as ghosts, black cats, skulls, etc. ), photographs of deceased loved ones, tools of divination, a small statue or figure representing the Triple Goddess in Her aspect of the Crone. Traditional Sabbat incense: apple, heliotrope, mint, nutmeg, and sage. Sacred Sabbat gemstones: all black gemstones, especially jet, obsidian, and onyx. Sabbat deities: the Goddess in Her dark saspect of the Crone, Hecate (ancient Greek goddess of fertility and moon-magick, and the protectress of all Witches), Morrigan (the Celtic goddess who presides over death), Cernunnos (Celtic fertility god), and Osiris (aqn ancient Egyptian deity whose annual death and rebirth personified the self-renewing vitality and fertilty of Nature). Candle colors: black and orange. The traditional Pagan foods of this Sabbat are apples, pumpkin pie, hazelnuts, Cakes for the Dead, corn, cranberry muffins and breads, ale, cider, and herbal teas (especially mugwort). Spring Equinox Sabbat (also known as Vernal Equinox Sabbat, Festival of the Trees, Alban Eilir, Ostara, and Rit of Eostre) is celebrated annually on the first day of Spring. Traditional ritual herbs: acorn, celandine, cinquefoil, crocus, daffodil, dogwood, Easter lily, honeysuckle, iris, jasmine, rose, strawberry, tansy, and violets. Altar decorations traditionally include hard-boiled eggs colored and painted with magical symbols to symbolize fertility, a lucky rabbit's foot amulet, a bowl of green and yellow jellybeans. Sabbat incense: African violet, jasmine, rose, sage, and strawberry. Sacred Sabbat gemstones: amethyst, aquamarine, bloodstone, red jasper. Sabbat deities: Eostre (Saxon goddess of fertility), Ostara (German goddess of fertility), the Green Goddess, and Lord of the Greenwood. Candle colors: green, yellow, gold, and all pastel shades. The traditional Pagan foods of this Sabbat are hardboiled eggs, honey cakes, the first fruits of the season, waffles, and milk punch. Summer Solstice Sabbat (also known as Midsummer, Alban Hefin, and Litha) is celebrated annually on the first day of Summer. Traditonal ritual herbs: chamomile, cinquefoil, elder, fennel, hemp, larkspur, lavender, male fern, mugwort, pine, rose, Saint John's wort, wild thyme, wisteria, and verbena. Altar decorations traditionally include summertime flowers, love amulets, seashells, aromatic potpourri, Summer fruits. Traditional Sabbat incense; frankincense, lemon, myrrh, pine, rose, and wisteria. Sacred Sabbat gemstones: all green gemstones, especially emerald and jade. Sabbat deities: Aphrodite, Astarte, Freya, Hathor, Ishtar, Venus, and other goddesses who preside over love, passion, and beauty. Candle colors: blue, green, yellow. The traditional Pagan foods of this Sabbat are fresh vegetables, Summer fruits, pumpernickel bread, ale, and mead. Autumn Equinox Sabbat (also known as the Fall Sabbat, Alban Elfed, and the Second Festival of Harvest) is celbrated annually on the first day of Fall. Traditional ritual herbs: acorns, asters, benzoin, ferns, honeysuckle, marigold, milk, weed, mums, myrrh, oak leaves, passionflower, pine, rose, sage, Solomon's seal, and thistles. Altar decorations traditionally include acorns, pinecones, autumn leaves, a pomegranate (which symbolizes the goddess Persephone's descent into the Underworld), a small statue or figure representing the Triple Goddess in Her aspect of the Mother. Traditional Sabbat incense: benzoin, myrrh, and sage. Sacred Sabbat gemstones: carnelian, lapis lazuli, sapphire, yellow agate. Sabbat deities: The Goddess in Her Mother aspect, Persephone (Queen of the Underworld), and Thor (the Lord of Thunder in old Norse mythology). Candle colors: orange, dare red, yellow, indigo, brown. The traditional Pagan foods of this Sabbat are corn and wheat products, breads, nuts, vegetables, apples, roots (carrots, onions, potatoes, etc. ), cider, and pomegranates. 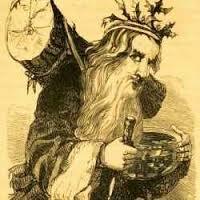 Kriss Kringle (the Pagan god of Yule and personification of the Yuletide spirit). Candle colors: red, green, white, gold, silver. The traditional Pagan foods of this Sabbat are roasted turkey, nuts, fruitcakes, caraway rolls, eggnog, and mulled wine.